What happens to migrants after they are deported from the United States and dropped off at the Mexican border, often hundreds if not thousands of miles from their hometowns? In this eye-opening work, Jeremy Slack foregrounds the voices and experiences of Mexican deportees, who frequently become targets of extreme forms of violence, including migrant massacres, upon their return to Mexico. Navigating the complex world of the border, Slack investigates how the high-profile drug war has led to more than two hundred thousand deaths in Mexico, and how many deportees, stranded and vulnerable in unfamiliar cities, have become fodder for drug cartel struggles. 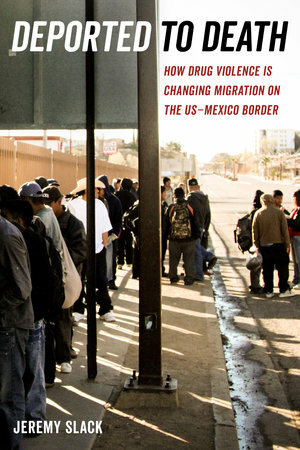 Like no other book before it, Deported to Death reshapes debates on the long-term impact of border enforcement and illustrates the complex decisions migrants must make about whether to attempt the return to an often dangerous life in Mexico or face increasingly harsh punishment in the United States. Jeremy Slack is Assistant Professor of Geography at the University of Texas at El Paso. He is editor of The Shadow of the Wall: Violence and Migration on the U.S.-Mexico Border.